We are all so busy these days – I get it. But the fact of the matter is, if there is something you REALLY want to do in your life, it will somehow get done. I’ve seen this played out many times before and was excited to recently see this phenomenon very clearly put into words. Straight from Stephen Covey’s famous 7 habits philosophy – imagine you have one empty jar that represents your life and two piles of rocks. One pile contains big rocks and the other small rocks. Both piles represent what you fill your life with. Your pile of big rocks represents the most important things in your life, such as family, career, health, relationships, etc. Your little rocks represent all the other less important stuff in life, such as chores, social media, trying to meet other people’s expectations, saying “yes” too much, etc. 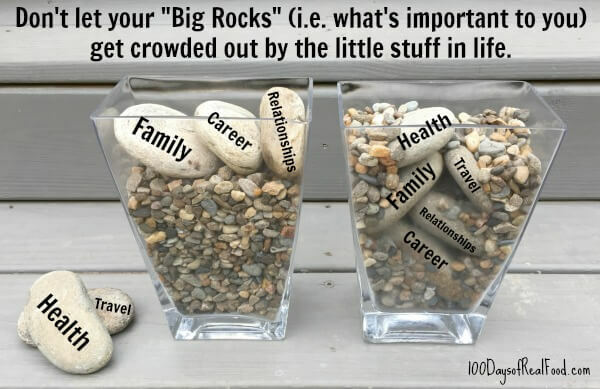 If you start by filling your jar with all the little rocks (i.e., the busyness of life), will there be room left to fit in the big rocks (i.e., the important stuff)? No! So, what you have to do is put those big rocks in first and then let the little rocks fit in around them. This signifies making the important things priorities in your life instead of putting them on the back burner in place of the other stuff that doesn’t matter as much to you. I think this philosophy can help in many ways, but (for me) it perfectly explains how you can fit real food into an already busy life. You simply make it a non-negotiable priority and let something else – that’s not as important in your life – fall by the wayside. And know that in the end, when you and your family experience improved health as a result, the effort will be more than worth this shift in priorities. I recently saw my sister-in-law take this thought process to heart with her new gym membership that started in January. The gym she chose tracks all your exercises and puts a competitive edge to it by showing your progress compared to other members. This served as good motivation for her, and, as my brother put it, she somehow found 8 extra hours in her busy week to exercise that she thought she didn’t have (as a mom who works full-time outside the home). And let me tell you what, she is looking and feeling great as a result! Again, if you decide it’s really important, you can make it happen. Change is hard at first – trust me, I know! When we cut out processed food back in 2010 (a very drastic change compared to the Standard American Diet we were eating at the time), I lost sleep at night over how we would do this. I had never before read an ingredient label, purchased anything that was organic, stepped foot in a farmer’s market, or eaten an entire piece of whole-wheat bread. I also didn’t know of very many blogs or books to use as a resource at the time, so it felt like a lot of work to figure it all out on my own. I honestly don’t recommend going cold turkey like we did. It was not easy! But what I do recommend is to start small, like with breakfast for example. Focus on cleaning up breakfast and then move on to the next meal of the day (or snacks) until little by little you establish a whole new routine. After lots of practice, it will eventually become your new normal, but if you fall off the wagon at some point, just brush yourself off and get right back on. Perfection is not the goal here because, as one of my favorite quotes says, done is better than perfect! Good luck, and remember, don’t be too hard on yourself! Any small step in the right direction is better than none. I wish I had seen this years ago. Not so much for myself–I’m a big rock kind of person, which has helped me find career success–but for my mom. She constantly got buried in the little rocks and was frustrated. This would have helped her, I think. Unfortunately I lost her in November. So sad that she spent 90 years so unhappy. As for processed food, the saying in our house is, if you’re going to eat merde (we’re in France), it’s going to be homemade merde. No industrial stuff. I agree! I made the switch to real food in 2014 (largely thanks to this website) when Iife was relatively calm for me. 2015 was crazy, but even when I cut out many other things, I never cut out eating real food. I did, however, make simpler meals and try less new recipes until I had more time again. The benefits of real food are just too much to compromise, no matter what!!! That ‘big rocks’ visual is so powerful, right? I first saw it about 5 years ago and several things just clicked in my life. I’m right there with you– perfection with your diet is definitely not the goal. I’ve never heard that quote, “done is better than perfect,” but I love it! An excellent mantra for perfectionists and type A’s. Love the big rock-little Rock analogy. And, up until 5 weeks ago, we had been making good progress toward real food living. Then we started our kitchen renovation project …. With no sink on the first floor for washing and prepping food, not to mention having to hand wash every pot, pan, utensil and dish in the basement slop sink, our “real food” progress has eaivered. Any tips for maintaining a real food lifestyle while living through a major reno? I lived through a major kitchen renovation last summer, 8+ weeks with no sink, oven, cooktop, kitchen table, useable outlets and 6 feet of counter space at best. What I did have, was a two burner plug in range, griddle, panini press, microwave and extension cords. I am proud to say we ate real food every day and I never once resorted to paper plates, cups, etc.. (I am Eco-conscious). We do have a small bathroom, near the kitchen so I had water access, but I have also washed them out on the deck. It helps to have a large bowl or wash tub to wash dishes in. We ate mostly whole wheat pasta/pasta salad, Panninis, grilled cheese and avocado, quesadillas, salads, veggie scrambles, pancakes/French toast, raw veggies, steamed veggies, fresh veggies, fresh fruit. Focus on meals that use minimal dishes for prep and cooking and don’t require much room to prepare. It will be trying, but just keep thinking ahead to your end goal. It is SO much easier to prepare real food in my expanded kitchen! Hi Lisa! I have been reading your posts and using you fabulous recipes for years. I just noticed, while reading this post, that McDonalds is an advertiser on your website… ? It surprised me! I find it ironic that while reading about cutting out processed foods that a McDonalds ad is just to the right trying to sell something. Is that something that you control? Sorry for the negativity – it was just such a shock and seemed very unlike 100 days of real food. Hi there. Every once in a while an add slips in that does not represent our site. Thanks for letting us know. Thanks for the boost I needed to get back on track. I made the whole food journey mostly on my own…so I know the advice you provide is invaluable. Wish I’d had it at the start, but oh well we’re here now. :-) Still learning, still improving, and still love your recipes.